A leaning chimney can be an eyesore on your home, but it can also be a danger to your family, your home’s foundation, and any neighboring homes that could be threatened if it collapses. Leaning chimneys often leave large gaps and can sway in heavy winds. Leaning chimneys are usually caused by problems with the soil beneath them. 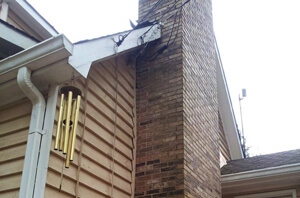 A leaning chimney may be accompanied by these signs of foundation failure. Because masonry is so heavy, the soil beneath them can compact easily and sink down, causing the entire chimney to shift. This can also be caused by poor soil compaction when the chimney was built. A chimney may be leaning because of a problem with the home’s foundation, such as a shifting slab. A leaning chimney may be caused by numerous other things such as poor brickwork. 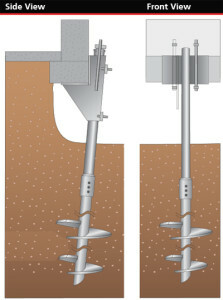 Helical piers can be used to stabilize the ground beneath your chimney. Piers are placed under the chimney or, in some cases, under the foundation walls to your home, to help lift and stabilize it. These piers will prevent future sinking due to soil compaction. 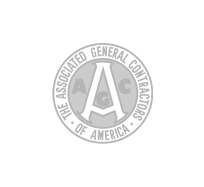 They also provide much-needed support for heavy masonry chimneys. Helical piers are useful when you notice many signs of foundation failure around your home. 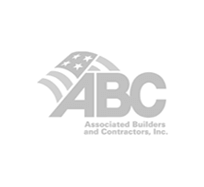 They can be placed under your foundation or chimney and are easily installed in tight places. Carbon fiber strips can be use when a chimney is more cracked than leaning. Carbon fiber strips are installed quickly and help support the chimney. These strips also assist in sealing cracks. Atlas Piers uses high quality ECP carbon fiber strips that ensure a durable repair. 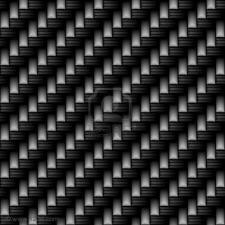 Carbon fiber strips are an eco-friendly and cost effective alternative to underpinning. A leaning chimney can be repaired in many ways, such as the options listed above. However, in some cases, it might be easiest to disassemble the chimney, apply foundation repair methods such as underpinning, and reassemble a new chimney. This is because a chimney that has leaned too far and is actively in use may be a fire hazard to your home and neighborhood. 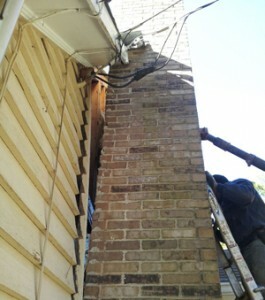 Give us a call at Atlas Piers of Atlanta today to ensure your homes safety for your leaning chimney. 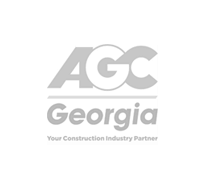 We service the surrounding areas of Atlanta, Georgia and we are happy to help restore your chimney to it’s original state. Also know that we can inspect the rest of your foundation to make sure you don’t have additional problems from the pressure of your leaning chimney. 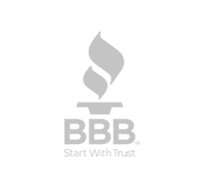 Trust the experts at Atlas Piers and call today!